The Tuloy Foundation was started by Father Rocky Evangelista in 1993. It is a comprehensive rehabilitation program for ‘street children’ in Manila that has achieved outstanding success and worldwide recognition since its inauguration. The Rotary Club of Clark Centennial has copied this successful formula in operating its own children’s project. chance for a better life. a decent, humane and Christian life. reliance and integration into society. Motivation. An atmosphere of freedom and caring is established to encourage children to leave the streets. Humanization. The children change their basic habits towards food, shelter and clothing, with an emphasis on personal hygiene, orderliness and cleanliness. Character development. The children are helped to cope with their emotional problems in an environment of loving care with moral and spiritual guidance. Education. The children attain a sense of self worth through academic and vocational training giving them the opportunity to aspire to a better and productive life. Pre-integration. Through apprenticeship and on the job training (OJT) the children are exposed to the working world to prepare them for future employment. Integration. They then enter the world of work and settle in new communities. 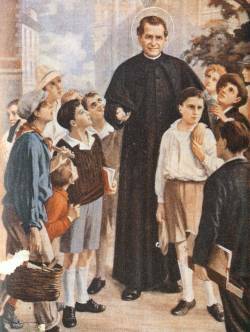 Saint Don Bosco was an Italian priest living in the 19th century who dedicated his life to caring for children. ‘Tuloy’ is a Filipino word meaning “Welcome” or “Come in”.